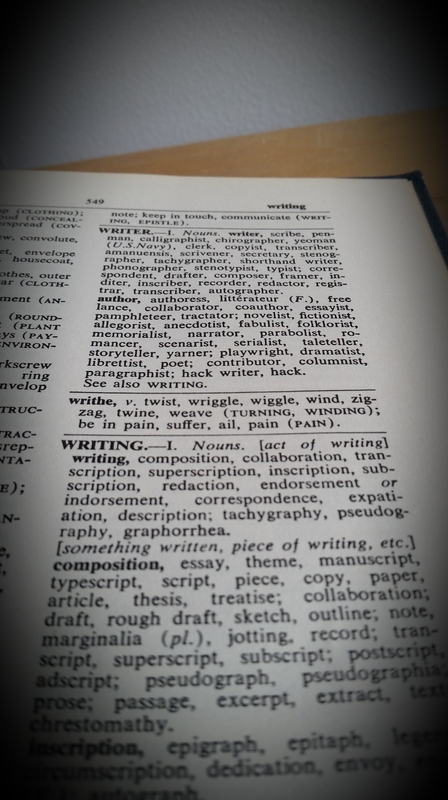 Today, I was presented with a 50 year old dictionary-style thesaurus. If you couldn’t tell, these words were one of my interesting finds as soon as I opened it. I’ve been wanting a new thesaurus. Of course with me, nothing has to be brand new. I find more enthralling characteristics in things with a little dust on them, I suppose. Cheers to you fellow aspiring, experienced, hobbyist, and career writers! This entry was posted in Inspiration, Tips and Tricks, Writing and tagged blogging, craft, inspiration, interesting, learning, resource, tools, writer. Bookmark the permalink.